The global automotive parts packaging market was valued at US$ 7,143.4 Mn in 2017 and is expected to be valued at over US$ 10,000 Mn by 2027 end. The market is expected to expand at a CAGR of 4.0% in terms of market value during the forecast period 2017-2027. In terms of volume, the market is anticipated to witness 1.5X expansion over the assessment period. Primarily driven by the increasing involvement of electrical and electronic equipment in the automobiles, the global market is observed to generate decent revenues. The global automotive parts packaging market is segmented geographically into five key regions including North America, Latin America, Europe, Asia Pacific and MEA. The global automotive parts packaging market is characterized by the fluctuation in the demand of automobiles and after sales market for spare parts. Moreover, increasing incorporation of reusable packaging while packing heavy components such as underbody components, engine components, cooling systems, and others will also support market growth in next few years. While disposable packaging is being widely preferred and has been rapidly replacing reusable packaging for multiple applications, the market for automotive parts packaging is expected to encounter with steady growth prospects over the forecast period. Adoption of flexible packaging is rising at a high pace compared to rigid packaging, which is another strong factor impacting the growth of automotive parts packaging market. On the basis of product type, the global automotive parts packaging market is segmented into pallets, crates, bulk containers & cases, bag & pouches, folding cartons, corrugated products, trays and protective packaging. In terms of volume, protective packaging is estimated to be the largest segment while in terms of value, bulk containers & cases is estimated to account for the largest global market share. Other than these, crates and corrugated packaging products account for significantly high market share. Due to consumer preference for eco-friendly packaging and high cost of bio-degradable plastic packaging products, corrugated packaging products are widely adopted in the automotive sector and further expected to rise at a high pace. Flexible packaging, specifically bags & pouches segment is projected to grow at the fastest pace among all the packaging products due to large number of small sized automotive components required to be packaged in lightweight and durable packaging. On the basis of packaging type, the automotive parts packaging market is segmented into reusable packaging and disposable packaging. 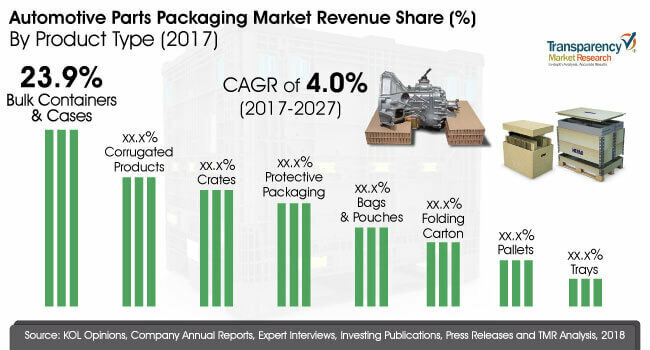 Disposable packaging segment is estimated to account for a larger market compared to reusable packaging, and is further projected to expand at a higher pace as that of reusable packaging segment. Disposable segment is majorly driven by the savings made by the consumer on the transportation of empty packaging which is required for reusable packaging. Developing production technology has enabled the manufacturing of strong and cost effective disposable packaging for one time use only. On the basis of component type, the global automotive parts packaging market is segmented into battery, cooling systems, underbody components, automotive filters, engine components, lighting components, and electric components. Lighting components segment is likely to continue dominance, followed by underbody components segment. Automotive filters and electrical components constitute the next key segments based on component type; however, the report highlights the highest growth prospects for electrical components. Some of the key players operating in the global automotive parts packaging market include Sealed Air Corporation, Mondi Group Plc, DS Smith Plc, Sonoco Products Company, Smurfit Kappa Group, Deufol SE, Encase Ltd., The Nefab Group, Primex Design & Fabrication Corporation, Sunbelt Paper & Packaging Inc., Loscam Australia Pty Ltd., CMTP Packaging Pty Ltd, JIT Packaging Inc., Pratt Industries, Inc., Signode India Ltd., Pacific Packaging Products, Inc., Monoflo International, Inc., Victory Packaging L.P., Knauf Industries, and Schoeller Allibert Services B.V.
To compute the market size, in-depth secondary research is done. Data points such as regional splits and market split by system type has been assimilated to arrive at appropriate market estimates. The report comprises the forecast of the global revenue generated by the business in automotive parts packaging market. Market numbers have been estimated based on extensive secondary and primary research, average pricing of automotive parts packaging by product type and the revenue is derived through regional pricing trends. Market size and forecast for each segment have been provided in the context of global and regional markets. The automotive parts packaging market has been analyzed based on expected demand. Prices considered for the calculation of revenue are average regional prices obtained through primary quotes from numerous regional automotive parts packaging manufacturers, suppliers, and distributors. All key end users have been considered and potential applications have been estimated on the basis of secondary sources and feedback from primary respondents. Country demand patterns have been considered while estimating the market for various end users of automotive parts packaging in the different regions. Bottom-up approach has been used to estimate the automotive parts packaging market by regions. Global market numbers by product type, by packaging type and by component type have been derived using the bottom-up approach, which is cumulative of each country’s demand. The same has also been validated from top-down approach. Company-level market share has been derived on the basis of revenues reported by key manufacturers. The market has been forecast based on constant currency rates. TMR triangulates the data via different analysis based on supply side, demand side as well as the dynamics of Automotive Parts Packaging market. TMR not only conducts forecasts in terms of value, but also evaluates the market on the basis of essential parameters, such as Year-on-Year (Y-o-Y) growth. This helps providers to recognize the future opportunities as well predictability of the market. A vital feature of this report is the analysis of the automotive parts packaging market by region, product type, packaging type and component type; and the corresponding revenue forecast in terms of incremental dollar opportunity. This is traditionally overlooked while forecasting the market. However, incremental dollar opportunity is critical in assessing the level of opportunity that a provider can look to achieve as well as to identify potential resources from sales perspective of the global Automotive Parts Packaging market. To understand key segments in terms of their growth and performance in the automotive parts packaging market, Transparency Market Research has developed a market attractiveness index. The resulting index should help providers identify existing market opportunities in the global automotive parts packaging market. In the final section of the report, automotive parts packaging market competitive landscape is included to provide a dashboard view of companies that manufacture automotive parts packaging. The report contains company profiles of some of the players in the global automotive parts packaging market. Some of the players operating in the global automotive parts packaging market include Sealed Air Corporation, Mondi Group Plc, DS Smith Plc, Sonoco Products Company, Smurfit Kappa Group, Deufol SE, Encase Ltd., The Nefab Group, Primex Design & Fabrication Corporation, Sunbelt Paper & Packaging Inc., Loscam Australia Pty Ltd., CMTP Packaging Pty Ltd, JIT Packaging Inc., Pratt Industries, Inc., Signode India Ltd., Pacific Packaging Products, Inc., Monoflo International, Inc., Victory Packaging L.P., Knauf Industries and Schoeller Allibert Services B.V.